Dr. Jessica Kumar might strike you as a familiar face around Nuvo. That’s because she has been a part-time technician and optical staff member for the past 3 years. She also completed one of her residencies with the Nuvo Orléans team. And so, we are now thrilled to have Dr. Kumar join our team of optometrists! Dr. Kumar embraces new technologies and is truly passionate about offering superior eye care to the community she grew up in. 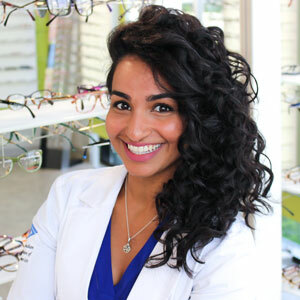 She puts a smile on everyone’s face with her enthusiasm toward optometry and she infuses the Nuvo life with positivity, humour and a great work ethic. • Completed an internship at the Eye Centres of South Florida in Miami. Dr. Kumar worked alongside ophthalmologists to provide refractive eye care and manage ocular disease such as glaucoma, macular degeneration, cataracts, diabetic eye disease, etc. Dr Kumar’s professional interests include ocular disease management, contact lens care (single vision & multifocal), and complete eye care for all ages. Dr. Kumar can complete an eye exam in 5 different languages: English, French, Punjabi, Hindi and Spanish! She also thoroughly enjoys outdoor activities, including hiking, and is passionate about travelling.